The public has long waited for an affordable electric car to emerge from Fremont, California. Such a car arrived Tuesday, but from a surprising manufacturer. GM made the first three deliveries of its new electric vehicle, the Bolt, just three miles from Tesla's factory in Fremont. The move was an apparent jab at Tesla, which is wildly popular with consumers, yet hasn't delivered its mass-market electric car, the Model 3. GM said it will deliver hundreds of Bolts to dealerships in California and Oregon before the end of the year. The two electric vehicles are natural competitors. The Bolt retails for $37,495, and the Model 3 for $35,000 (both prices are before potential tax credits). The Bolt has a range of 238 miles and the Model 3 of 215 miles. So far, reviews of the Bolt have been positive. It was named the 2017 Motor Trend Car of the Year. Meanwhile, Tesla has said it will begin delivering Model 3s in 2017. It says it has 373,000 pre-orders, although it won't be able to immediately deliver all of those. If Tesla was able to meet demand, the Model 3 would immediately become one of the best selling cars in the country. As Tesla hustles to match demand, there's a opportunity for Chevrolet to target customers interested in electric vehicles. So far, the automaker isn't fully seizing that opportunity. While Tuesday was a triumphant day for Chevy, it's possible that Tesla will still have the last laugh. 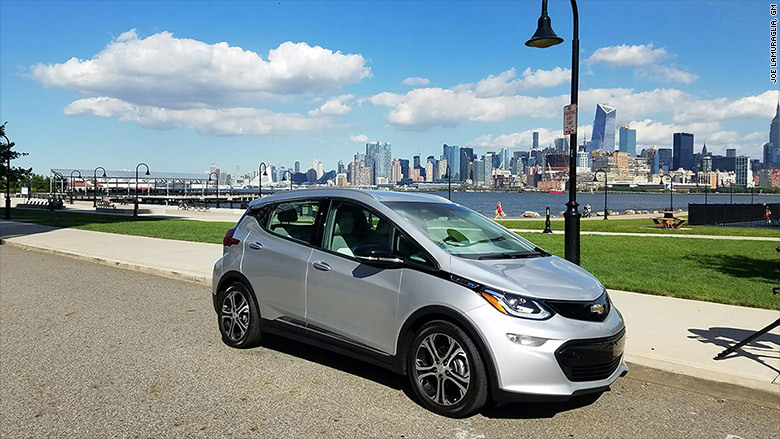 Tony Posawatz, the former lead engineer for Chevrolet's hybrid Volt, tweeted Sunday that he wasn't sure of GM's commitment to the Bolt. In 2015, GM (GM) said the Bolt would launch in 50 states. But now Chevrolet is only delivering Bolts to Oregon and other parts of California. Its national rollout will begin in 2017, with deliveries in New York, Massachusetts and Virginia. Dealerships in major markets will receive Bolts in the first half of the year. "Little [publicity], two-state launch," Posawatz tweeted. "Why wouldn't they want to sell more before [the] Model 3?" The first three Bolts were bought by San Francisco Bay Area residents who are replacing other electric and hybrid vehicles. It's still unclear when electric vehicles will truly enter the mainstream. Tesla (TSLA) has made a habit of missing its own aggressive deadlines. For anyone who decides today that they'd like to reserve a Model 3, the earliest they'll receive their car is the middle of 2018.